Before I get into this soup recipe, if you are looking at this in Reader, come on over and check out my new blog design! I love the new look, and hope you will find the new Recipe Index page easy to navigate and helpful! Special thanks to Derrick C. Lee for my logo, his awesome ideas and vision, and all of the time he spent working with me, and to Lynsey at Shiny Magic Design for the web design. And now, this amazing soup. Sometimes I'll make a new soup recipe and think that it would make the perfect soup course for a dinner party- like this Onion Barley Soup with Swiss Cheese Flans, or this Creamy Carrot and Potato Soup with Dijon or Dill. Last week I made a new recipe that falls into the dinner party category. I know asparagus isn't in season here yet, but I found some really nice looking asparagus at the produce store last week. I bought it not sure if it would become part of a dinner, salad, or something else, but it was lucky and became the star ingredient in this great recipe for Creamy Asparagus Soup on the Simply Recipes web site. To make it even better, this is a super simple recipe that comes together quickly with just a few ingredients. I made a few minor changes to the recipe, including omitting the vermouth at the end. I didn't know if my little one would be eating it so I didn't want to add alcohol since it wouldn't have the chance to cook off. I honestly didn't miss it - I think the lemon at the end added the perfect brightness. Add the chopped asparagus stalks (not the spear tips), sprinkle with salt and pepper, and cook 5 minutes. In the meantime, bring a small pot of salted water to a boil. 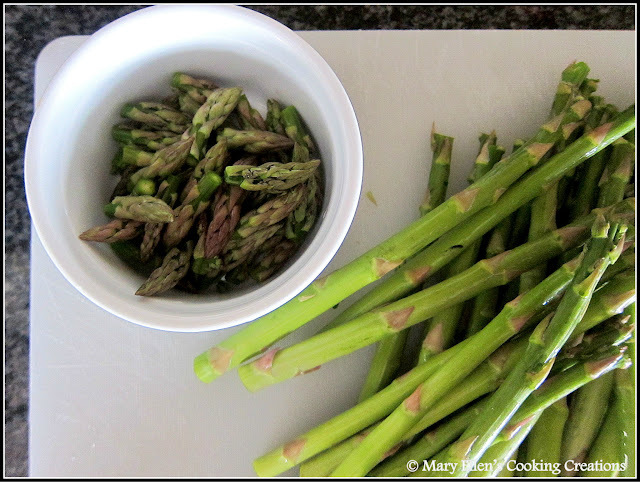 Add the asparagus tips and cook for 2 minutes. Remove from the pot and place in a bowl of ice water. Set aside for garnish. Add the broth and thyme. 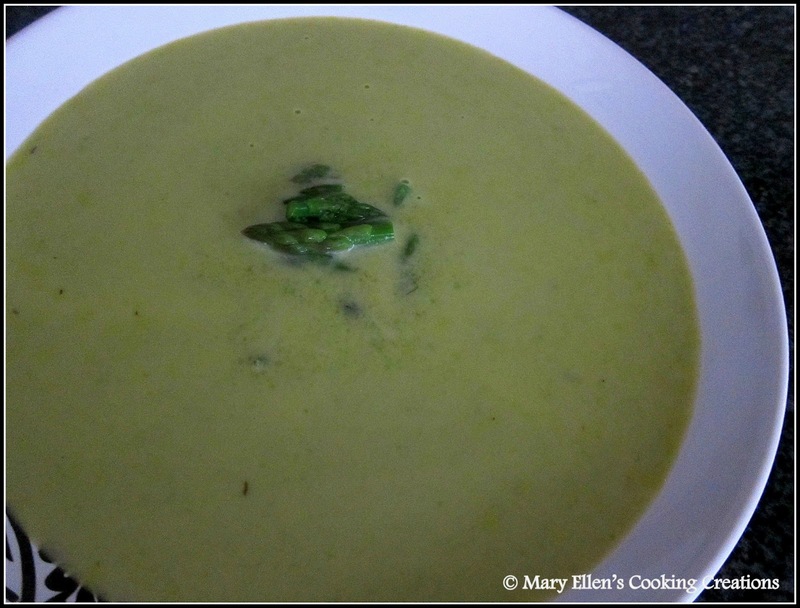 Bring to a boil, then reduce to a simmer until the asparagus is tender, about 10 minutes. Remove from the heat and puree with a handheld immersion blender (or transfer to a blender and puree in batches). Stir in the cream and gently reheat. Stir in the lemon juice and adjust salt and pepper, if needed. Serve garnished with asparagus tips.